A few entries back I promised to post some of my all time favorite recipes from Gourmet Magazine, since November was their last issue. I saw this recipe and I was struck by the person who sent it in – she was living in Paris, and this cake always got rave reviews from the kids and their parents. Now, I studied in France when I was in college – and I know that people in France think that peanut butter is just disgusting. Nutella is their version of peanut butter. So, I knew by reading the recipe that there would not be a lot of peanut butter flavor in this cake – and I was right. Either that or the parents and kids she was talking about were also American. 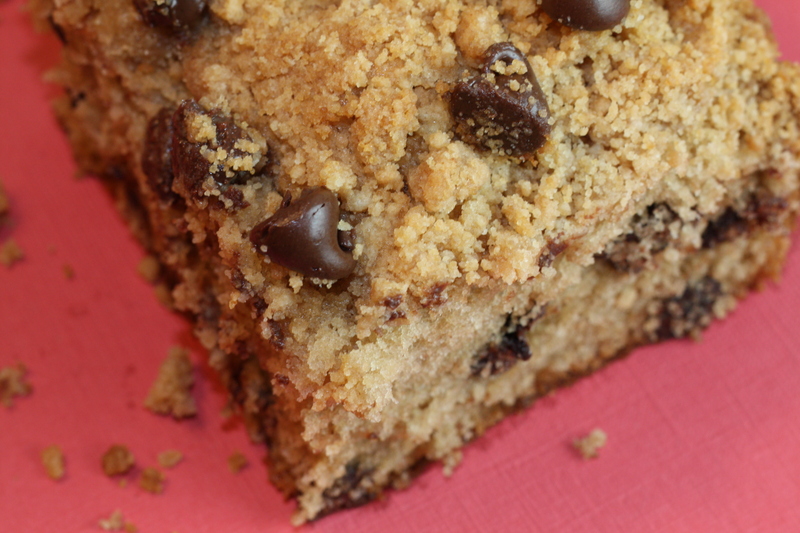 But, this is such a moist and delicious cake, and the chocolate chips really give it a perfect amount of sweetness – that I have made this over and over again. This is so easy to make, I can whip it up in less than 15 minutes – then into the oven it goes. It also stays good for a few days after you make it, as long as it is wrapped well. 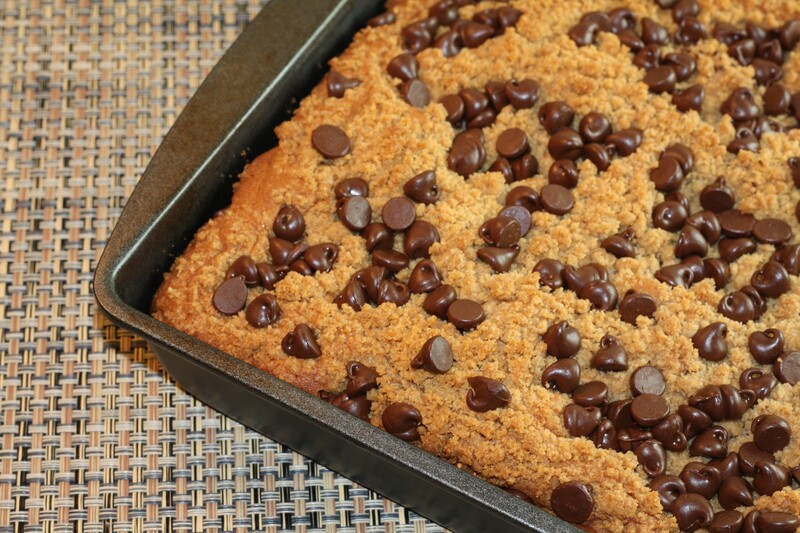 My husband eats it like a coffee cake in the morning; I like it as an after dinner treat. Preheat oven to 350°F. Butter 13x9x2-inch metal baking pan. Combine first 4 ingredients in large bowl. Using electric mixer, beat on low speed until streusel is blended and crumbly. Transfer 1 cup lightly packed streusel to small bowl and reserve. Add eggs, milk, vanilla, baking powder, and baking soda to remaining streusel in large bowl. Beat at low speed until evenly moist. Increase speed to medium and beat until well blended, scraping bowl occasionally, about 3 minutes. Stir in 1 cup chips. Transfer batter to prepared pan. Sprinkle with reserved 1 cup streusel and remaining 1 cup chips. I always love pb in cakes!